Rotor INpower 3D+ MAS Power Meter Crankset is rated 3.0 out of 5 by 2. Rated 5 out of 5 by MaxKay from Excellent value! I've been using it for 2+ months now (circa 1k km) and very happy with it. Seem to be very accurate. Very long battery life. Nice look and quality. Great sync. Light and durable. Just make sure to read the instructions before use to open the battery compartment correctly and be aware of the rubber band inside. Rated 1 out of 5 by James2204 from So many faults Whilst the product itself appears very light and the data appears incredibly accurate, there are a whole host of issues outside of this. To power the product, it requires simple AA batteries, which are supposed to last 300 hours. I am now on my 3rd battery in 4 rides. Perhaps I am just being unlucky, but after riding for circa 30 minutes, all power data disappears and you cannot pair the product again. I am trying to pair with a Garmin 820 headset. It is also impossible to download the Rotor software that supports the product. I spent 2 hours on the phone to Apple, who used remote access and even they couldn't get the software to run. I am using a year old MacBook Pro, so it's not because my operating system is out of date. The issues have been reported to Rotor (by email) because there is no UK phone number, but they fail to respond. Strongly advise not buying the product. Do I need to get Rotor chainrings for this? Can I use my stock FSA chainrings with the same bcd? You would be able to use any chainring as long as the BCD/PCD and bolt patten are the same. Can you please confirm if the chain ring bolts are included with this item? Thanks! I can confirm chainring bolts are not included with the crankset unfortunately. This crankset has a 30mm axle and can be used with BB30 bottom bracket systems. A replacement BB30 bottom bracket would be required. 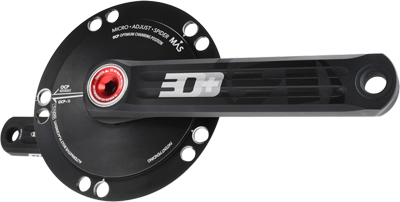 This will be the MAS (Micro-Adjust Spider) crankset. The difference here will be the weight and also the more aerodynamic design of the Flow crankset. Is this compatible with 11 speed? This crankset will be 11 speed compatible when used with Rotor chainrings. If your current ceramic BB is suitable for a 30mm spindle this will be fine. I hope this helps. Hello, Will this be compatible with a felt f85 frame? I have another bike which is bb30 and hope that they can be transferred Thanks! I can confirm that as long as the frame uses a BB30 bottom bracket this will fit with no issues at all. I hope this helps. I can confirm that this would be compatible with your cannondale and BB30a bottom bracket.